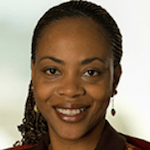 Dr. Valerie Nkamgang Bemo is a deputy director in the Global Development Office of the President at the Bill & Melinda Gates Foundation, where she is responsible for the emergency response portfolio. Bemo has more than 20 years of experience in development, clinical and public health worldwide. Before joining the foundation, she held various roles at the International Rescue Committee, most recently serving as senior technical adviser for health in the Democratic Republic of Congo and West Africa. She also worked with various NGOs and had extensive involvement in Indonesia (Aceh), Spain, Cote d’Ivoire, Sierra Leone, Mauritania, Kenya and Chad. She is a board member of several global health nonprofit organizations. She earned her medical degree at the University of Cote d’Ivoire, her epidemiology diploma at the University of Paris and her master’s degree in public health from Madrid Autonome University.